Nation building is a Herculean task and undertaking literacy drive among girls a vital step (‘Forest for her’, November 1-15, 2011). Literacy among the girl child works as a catalyst for social uplift. Keeping this in mind, eradication of illiteracy has remained a major national concern for the past many decades. In 1988 when literacy rate was 50 per cent, the Centre ambitiously launched the National Literacy Mission. Its aim was to attain a rate of 75 per cent by 2007. Manmohan Singh launched the Saakshar Bharat Mission for Female Literacy in 2009 to reaffirm the nation’s commitment to educating people. India could reach 74 per cent by 2011. This shows the government’s dedication. The latest census leaves a lot to be desired—female literacy stands at 65 per cent (53 per cent in 2001) while for men it is 82 per cent (75 per cent in 2001). One wonders why despite India’s booming economy, educational opportunities remain out of grasp for girls, especially those in rural areas. The reasons could be inadequate school infrastructure, inefficient teaching staff, poverty, caste disparity, sexual violence, illiterate mothers and, as the write-up rightly pointed out, ecological degradation. Many parents are reluctant to send their daughters to co-ed schools. Urbanisation has flooded cities and towns with an army of migrant workers. Education of the children of this workforce often gets neglected as economic concerns remain their priority. Hygiene is vital, especially when girls are menstruating, so toilet facilities should be improved. More girl schools should be opened. Women, especially mothers, should be educated to make them understand how knowledge can make the girl child stand to the ills of society. Most importantly, poverty should be tackled. 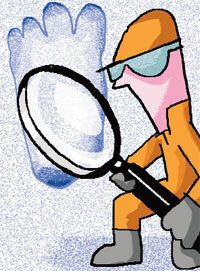 The Abominable Snowman, or the Yeti, has been a mystery for years (‘Yeti divides academics’, April 16-30, 2011). Recently, the governor of Kemerovo in Siberia announced that Yetis exist within the borders of the Russian coal-mining region. Researchers have found footprints and some coarse hair samples. Scientists around the world have historically disputed the existence of the Yeti given scant conclusive evidence. In his book My Quest for the Yeti, mountaineer Reinhold Messner concludes that large native bears are responsible for Yeti sightings and tracks. But numerous sightings of the Yeti have been reported in Himalayan countries and North America. It remains to be known whether Yeti is for real or the announcements are mere stunts to boost tourism. This refers to the editorial, “The bogey of green clearances” (October 16-31, 2011). More than 1,200 illegal hotels have polluted Kodaikanal town in Chennai. Untreated sewage flows down the roads and water streams. The hotels are operating without licences from the state pollution control board. They had procured licences from the municipality. After our protests, some licences were cancelled. However hoteliers, builders and the municipality are working hand in glove. We took the matter to the Madurai Bench of Madras High Court. It has been a year, the respondents have not even filed a reply. Clearances by the Union ministry of Environment and Forests have not only continued at an unsustainable pace, but they seldom reflect rigorous consideration of what a project will cost the environment. Why the group of ministers should bother themselves about further weakening the regulations when they already are getting all that they want through administrative disregard of the law. The issue of environmental protection vis-a-vis economic growth is a recent phenomenon. Capitalism in its early stage was confronted with the problem of market sharing and cartel formation. Progress of capitalism never cared about the environment. Current situation is, however, different. If the West compromises with ecology while working towards development, it faces public protest. But then these developed countries buy carbon credits and continue to damage the environment. India, on the other hand, needs industrial progress. Decline in Index of Industrial Production (an index that details out the growth of various sectors in an economy) is a cause for worry for the government. Hence clearing projects without considering their risks. Balancing development with environment and ecological depletion is a problem for India. Normative approach is ideal. But does it really happen? Lobbyists must balance their proactive stand against industries. India has to progress under a democratic setup with a growing population which is a drag on her resources. During a speech US Senator John Kerry said that India is the fourth largest emitter of CO2 emissions while China is the world’s largest. India’s energy consumption is projected to quadruple over the next 25 years. Findings from various research point towards a visible change in the climatic conditions around the world. Floods, earthquakes, tsunamis and torrential rains have caused global mayhem. We cannot reverse climate change but can mitigate it. We immediately need to switch over to renewable energy sources. This refers to the cover story, “Fatal resistance” (October 16-31, 2011). Antibiotics overdose is one of the reasons for microbial resistance against antibiotics, for which poor waste disposal system is to be blamed. Hospitals are in focus because most cases of drug resistance are detected there. Hospital waste contains cocktail of medicines. Only solid waste generated from hospitals, known as biomedical waste, is sent for incineration. Untreated hospital effluent finds its way to storm water channels, nullahs and other drains. As a result, these drains have high levels of active pharmaceutical ingredients. This provides microbes a cocktail of drugs and some of these species develop resistance against them. In many cases, sewage treatment plants (STP) have been found to contain most of the drugs used in hospitals. The government should make a policy by which we can reduce the levels of drugs reaching the water matrices. The buy-back scheme of unused medicine can bring a vital change and more efficient sewage plants can help reduce the threat. The article, “Darkling waters” (October 1-15, 2011), clearly illustrates the present situation of the Bagmati river in Nepal and the challenges authorities face in reviving it. The issue should be viewed in two ways: surface contamination that affects the health of the people and environment, and pollution of groundwater which permanently affects aquifers. The former can be addressed with community strategies and interventions with better coordination among government and non-profits. The second issue can be handled by mapping the quality of the groundwater. This can be done by deploying surface geophysical tools. 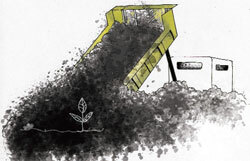 The editorial “20 years to…where?” (October 1-15, 2011) states that if growth is costing the Earth then it must be redefined, and proper sharing of the planet should be ensured. One of the suggestions in the write-up is putting limits on consumption and production. This reduction would be significant only initially. After a point it would not be able to contain the consumption because the number of consumers will increase. As the model is based on the world view of consumerism in which happiness of an individual depends on his ability to consume, the problem will continue. There is no limit to a person’s desires and resources are limited. To avoid unnecessary consumption, one must understand that happiness lies in needs, not desires. 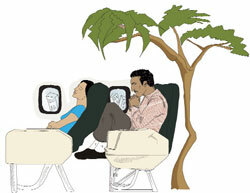 This refers to “Neem is traditionally ours” (October 1-15, 2011). Every inch of neem is useful. We used to have neem trees in front of our house; they guaranteed fresh air throughout the day. Our mother used to apply neem leaves as medicine against worms. Its bark is one of the main ingredients in kashayam (decoction), an age old recipe to thwart illnesses. Neem oil also plays a big role in ayurvedic medicines. Despite numerous benefits, neem’s potential has not been fully tapped. Tamarind is another such case. The article “Cancer-immune, naturally” (October 1-15, 2011) clearly explains how a person’s diet can help reduce risk of cancer. Perhaps homemade masalas used in curries and other dishes were aimed at preventing diseases. But can we give up on the readily-available masala powder in the markets? Non-believers will never change (‘Among the non-believers’, September 1-15, 2011). It is human tendency to not appreciate what is available and to understand its value only when it is lost. The likes of Reddys are milking profits from forest resources because of their political power. 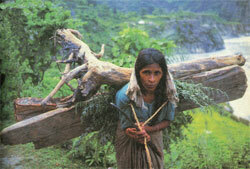 Thanks to the vision of the then prime minister Indira Gandhi, the Forest (Conservation) Act was enacted in 1980. It has been crucial in saving the forests but political will has put the forestry sector in misery. Foresters can neither influence vote bank nor can give away forestland, so politicians and the public love to hate them. Forest officials still have the colonial mentality that forest is their own property. But it is also true a community alone cannot protect forests. Time has come for a serious introspection on the roles of the forest department and community in joint forest management. The government should clearly chalk out the ownership rights of forest and its resources among both the community members and forest staff. The interview, “Pursuit of happiness” (November 1-15, 2011), mentions the name of secretary of Bhutan’s planning commission as Kerma Tshitseem. It should be Karma Tshiteem. We regret the error.